Michigan officials are hoping to double the amount of fish-gulping cormorants they can shoot and kill in the Great Lakes. A growing population of double-crested cormorants - large migratory shorebirds that can eat more than a pound of fish per day - have been decimating fisheries and irking anglers for years in parts of the lakes. Like most environmentally enlightened birders, I'm excited by the prospect of erecting a string of colossal power-producing windmills in Lake Erie. Wind is infinite and plentiful on the lake, and immeasurably cleaner than coal-burning power plants. Birders know better than most the terrible impact on birds of acid rain, mercury and global warming. Shots will ring out on Middle Island as early as Friday as Parks Canada officials begin culling double-crested cormorants for a second year, according to an animal rights advocate. 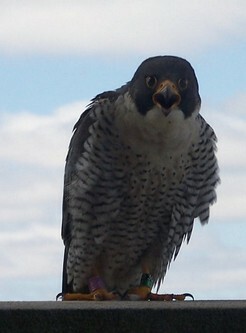 The Falcon Cam is back on in downtown Mt. Clemens, Michigan, just in time to catch the miracle of life taking place in one of the city's highest perches. All quiet on the waterfront â€“ except at 2 p.m. on Burlington Bay. That's when the trumpeter swans touch down, knowing that food is on offer, and the air rings like a brass band gone bad. They are the fastest creatures in the world. They are the "kings and queens" of stealth. Though both go unnoticed for the most part, we share our downtown with some pretty spectacular birds of prey -- namely the swift-moving peregrine falcon and the silent hunter, owls. Londoners got a glimpse of some of those birds three weeks ago when a great horned owl was rescued by London firefighters and a wildlife specialist after it became trapped between two downtown buildings. Bald eagle nest spotted in Butler Co. The first reported nest in Butler County in modern times has been confirmed on Martin Marietta Materials property in Ross Township, according to state wildlife officials. Many years ago, the majestic birds were plentiful in this area, said Kathy Garza-Behr, wildlife communications specialist for the Ohio Department of Natural Resources. Eight years ago, I wrote a front-page story about my friend Larry Rosche's 25-year quest to see an ivory gull -- and the frustration he experienced in his many missteps along the way. I'm beginning to know exactly how he felt. During a winter that may offer the best opportunity ever to see one of these stunningly beautiful, rare white visitors from the Arctic, I remain unfulfilled. GRAYLING -- Sick of staring out my office windows at seemingly endless snow falling on Lake Margrethe, I wandered into town the other day and stopped in the Old Au Sable Fly Shop. After the ink dries on the Federal Register in a little more than one month, the gray wolf will again be off the endangered species list and back to being managed by the state. The Royal Botanical Gardens hopes to be home to the first bald eagle nest on the north shore of Lake Ontario in more than half a century. Tys Theysmeyer, acting head of conservation, says it could happen as soon as next spring.